Vintage Estate Homes is dedicated to constructing homes of the highest quality with superior craftsmanship and second to none customer service. As a family operated business, they truly value the opportunity to build your home and are committed to delivering the personalization and attention to detail that you’re looking for. Vintage Estate Homes strives to create a seamless home buying experience – from the initial meeting through homeownership. They are happy to guide you every step of the way, with things like choosing your homesite, customizing your options, selecting your finishes at their professional design studio, and securing your financing. Vintage Estate Homes offers land/home packages with financing, which you would secure with a preexisting home purchase. They deliver you a customized home without the hassle. Upon moving in, you will enjoy peace of mind knowing your home is covered with both a comprehensive systems and structural warranty. When building a new home with Vintage Estate Homes at RedTail, you are offered the opportunity to choose from floor plans ranging from 2500 square feet to 4000 square feet; each set on half acre homesites with your choice of overlooking the golf course, lakes or mature oaks. Choose the options, features, and design that best fit your needs and lifestyle! For more information, visit www.vintageestatehomes.com. 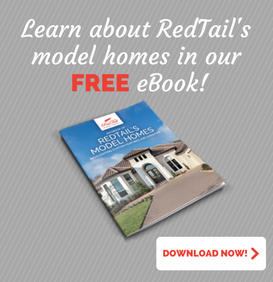 When you visit RedTail stop by Vintage Estate Homes’ model home center at 32211 Red Tail Boulevard. Model Home Hours: Mon. : 2 p.m. – 6 p.m., Tues.-Sat. : 10 a.m. – 6 p.m., Sun. : 12 p.m. – 5 p.m.